Greek wineries and biking in the countryside where traffic is sparse are two elements that make the Cycling 4 Wine events an entertaining way to spend a Sunday. 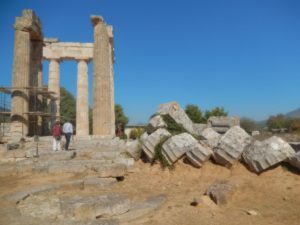 I participated in the most recent ride this past October, 2014 in Nemea, one of Greece’s premier wine regions, located about an hour and a half drive from Athens in the Peloponnese peninsula. 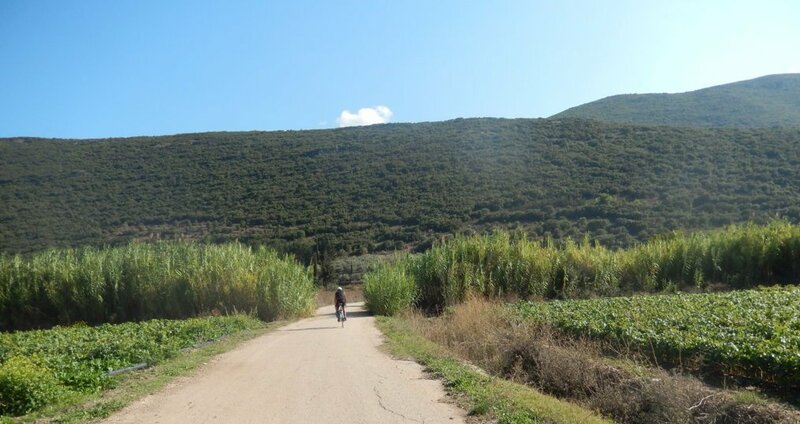 The Nemea and Attika regions have so many wineries that Cycling 4 Wine’s organizer, Themistokles Nicoletopoulos, is able to create new routes each year bringing cyclists and vinticulturists together. Themos has a connoisseur’s knowledge of fine indigenous wines and appreciates an elegant bicycle, like his Bianchi which he dubbed Pegasus. This year 210 cyclists participated in the Nemea ride, most coming by their own car. For twenty euros the car-less crowd (I, for one) were transferred to Nemea by a coach rigged with a two-tiered trailer holding the passengers’ bicycles. From 10:00 am to 4:00 pm, participants rode at their own pace from winery to winery following arrows spray painted on the road to show the turns. You can also download an app to your GPS or iPhone that maps the route. This year’s mileage was 42 kilometers (26 miles) with long flat stretches enhanced by two hills rising to 415 meters (1361 feet). 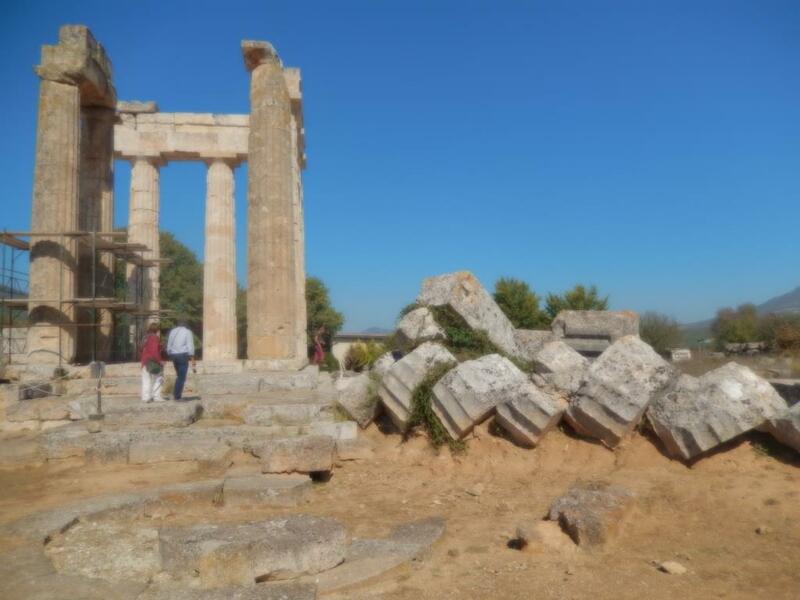 Nemea has an ancient history of wine making. One of its most popular and oldest varieties is the Agiorgitiko, a deep dark red wine whose grape vines, legend has it, were stained by the blood of the Nemean lion slewed by Hercules as one of his Twelve Labors. We were treated to an exquisite Agiorgitiko at the incomparable Pappaionannou Estate whose organic grapes have been cultivated by the family since 1876. At Domaine Rapani we tasted the exotic dry white wine known as Moschofilero whose ideal terrain is the high plateaus of Nemea. At the Nemea Wine Cooperative, founded in 1937, we sampled Malagousia, a white wine with citrus and peach characteristics, which was rescued from extinction in 1983 by a Halkidiki oenologist. The twenty euro entry fee included a buffet dinner at the Cooperative. There were four places in ancient Greece where athletic events were held every four years: Ancient Olympia, Delphi, Isthmia and Nemea. 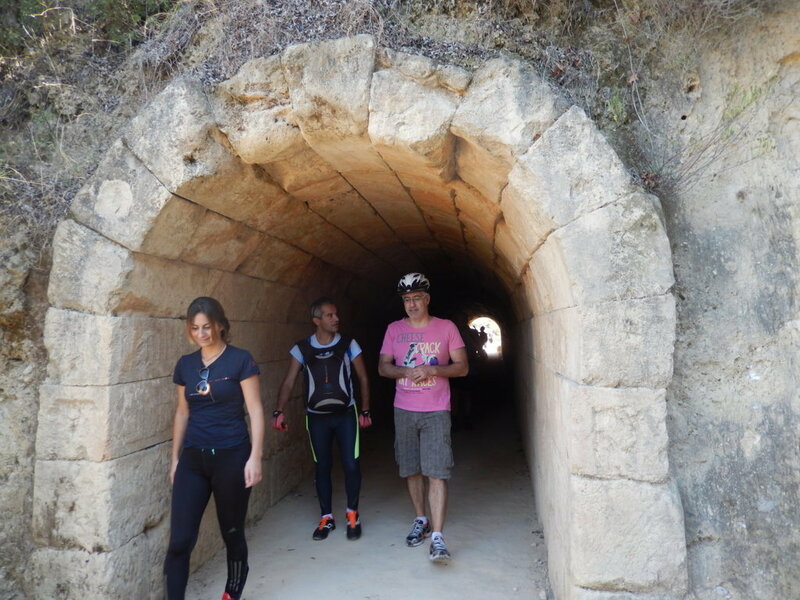 The most exciting feature of this year’s Cycling 4 Wine was biking to Ancient Nemea for a private tour with Dr. Stephen Miller, a retired archaeology professor from UCLA Berkeley, who has been studying and digging at the site since 1973. It was akin to touring Mycenae with Heinrich Schliemann! Dr. Miller walked forty of us through the grounds and the museum explaining the history, telling rich stories and pointing out delightful aspects, such as the graffiti in the long spectacular tunnel leading to the stadium. Starting in 1994, Dr. Miller helped launch the revived Nemea Games held every four years with sports and music and dance similar to the ancient Games. Anyone eight years and older can run in the foot race competitions in the stadium, 90 meters in length. Nowadays participants wear short white togas rather than compete naked as the original athletes did. Just as in the past, winners are crowned with a wreath of wild celery. The next Revived Nemea Games are scheduled for June 11, 2016 where a 7.50 kilometer race, “The Footsteps of Herakles,” will begin at the Temple of Herakles in Kleonai and end in the Nemea stadium. The organizers of the Revived Games state that their aim is to reproduce the spirit of the original Games which sought to substitute athletic competition for war. Coincidentally, that same spirit of camaraderie and brotherhood is also present in Cycling 4 Wine events where riders gleefully pedal along rural roads flanked with vineyards and raise their wine glasses in a series of toasts at each winery on the itinerary.